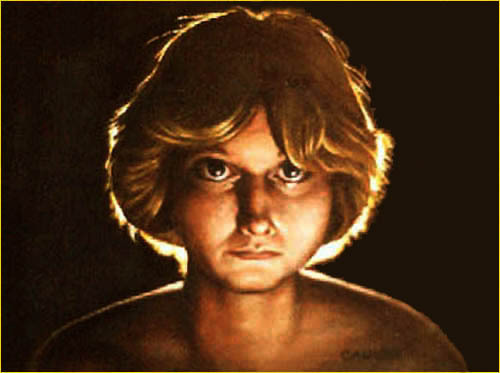 The lovely "Lisa" owned my heart for a good part of the late 70's. 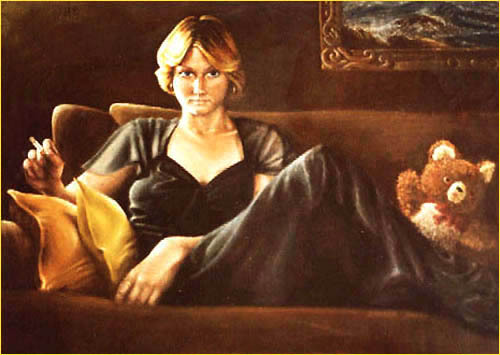 "Lisa"was the subject of many of my early paintings when I was first learning my craft. Here are two of those paintings. Both are pretty moody, but I like them. In "Gold Dust Woman", a ghost figure appeared, wrapping his arms protectively around "Lisa" from behind the couch. I had painted over an old painting without gessoing it first and my self-portrait bleed through. Its eerie, but kewl. The song "Lend Your Love to Me Tonight" by Emerson, Lake, & Palmer was playing on the stereo at the time I was taking photos of "Lisa". I asked her to look up and clicked the camera as a sympathetic tear rolled down her cheek. Click here to return to Paintings.